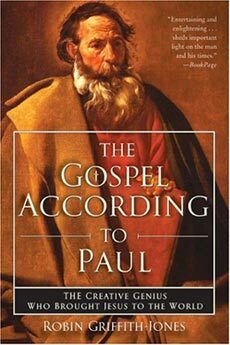 The Gospel According to Paul: The Creative Genius Who Brought Jesus to the World by Robin Griffith-Jones. HarperSanFrancisco, 2004, $16.95. Robin Griffith-Jones, an Anglican cleric known for his wit and good humor, is Master of the Temple Church in London. To be precise he’s the Reverend and Valiant Master of the Temple (“I have the ancient title,” he says, “but unfortunately none of the power”), a distinction which would have meant very little to the public a few years ago but today, thanks to The Da Vinci Code, makes him just possibly the custodian of the Holy Grail. You would think that Griffith-Jones already had plenty of sin on his hands, since the Temple Church is part of the Inns of Court (lawyers) and sits on Fleet Street (journalists), without having to deal with hundreds of tourists, all determined to have a look at the most famous church of the Knights Templar. But Griffith-Jones has proven himself valiant indeed, choosing to look at the attention as a chance to witness, sponsoring regular lectures on the difference between the gospel of Dan Brown and the gospel of Christ. “It’s an opportunity,” he says, “for people to ask questions about Christianity that they would otherwise be too polite to ask.” In fact, he’s now taken up a systematic rebuttal to Brown in the recently published The Da Vinci Code and the Secrets of the Temple, with a book on Mary Magdalene yet to come. But Griffith-Jones was already a theologian—more properly a theological historian—before all this, and it’s to this earlier work on Paul that I was drawn. Anyone who sets out to write about Paul—not just a single letter but all of Paul, his life, his ministry and his writings—gets credit from me just for stepping up to the plate. I would think that the first thing you would have to do would be to spend about three months just looking at ancient maps and trying to figure out how many journeys he made, what was the order of his itinerary, how many times he doubled back, and which letter to which church was written from which city. This would be followed by reviewing all the textual theories—how many letters to the Corinthians were there and how many are missing and how many were patched together into one text?—and then at some point you would have to look at all the extra-biblical writings intended to support or discredit Paul, and even then you would only be at the very beginning of your task, with all the contradictions and mysteries within the letters still to come. At some point, in other words, you have to limit what you’re deciding to study, and despite this book’s length (527 pages), Griffith-Jones has wisely chosen to depart from the army of Pauline scholars in only two areas that I can find. One is his emphasis on placing the Damascus Road experience in the context of previous Old Testament visions of heaven. For example, he goes into the chariot-throne vision of Ezekiel and how it was probably taught by the rabbis of the Second Temple period. It was a semi-secret teaching—you could study it if you really wanted to, but they made you jump through a few hoops due to the fact that it was considered a form of mystical meditation. Paul, the ultimate student of Torah, definitely would have heard discourses on that vision, and so when he ascended to the “third heaven” he would have known what he was seeing. The importance here is to distinguish Paul’s experience from a lightning bolt—it was the decades of study that made the experience possible. The other achievement of this book, I think, is Griffith-Jones’s explanation of what was probably going on in the day-to-day affairs of five churches—Thessalonica, Galatia, Corinth, Rome, Philippi—that would lead Paul to write so urgently. The various factions in Corinth are particularly well defined, and the impression here is of a primitive version of the mega-church, with, on the one hand, wealthy patrons necessary for its survival, but with many gifts of the spirit revealed among the poor and lowly, and a sort of hierarchy developing in both directions. In a passage I’d never seen explained so precisely before, Paul appears to be telling the poor not to be contemptuous of the rich, in spite of the paucity of their spiritual gifts. All of these insights are created indirectly, by the way. Griffith-Jones has an elliptical style of writing that’s never so pointed as I’ve made it seem here. But the portrait of Paul that emerges is of a man always on the brink of utter failure and ruin, his mission to the Gentiles ever at risk, his own stature in his own churches forever in doubt. Having said all this, there are some annoying aspects to Griffith-Jones’s re-telling of the journey. One is his attempt to modernize all the scriptural translations with words that don’t exactly sing (“wrongdoing” for sin, “breath” for spirit, “Anointed” for Christ, “The Mission” for Acts), and another is his rhetorical breakdown of each letter, as though these documents were Ciceronian exercises in persuasion. When he gets to the earth-shattering passages in the middle chapters of Romans, the power of the appeal is diminished as a result. His focus is too much on the recipients of the letter (law-observant Jews vs. law-free gentiles) and not on the universality of it. But then again, perhaps an occupational hazard of calling yourself an historian is that you’re not allowed to bring it into the present. That said, it’s a thoughtful and occasionally daring work that he intended to be a companion to his previous book on the gospels, The Four Witnesses (which I haven’t read). If a few of his new Da Vinci Code fans use this work as an introduction to Paul, they could do much worse. That's YOU writing that book review? Whew, I had no idea based on previous items you've written that you read theology THAT deeply. Bravo! Word. Keep an eye peeled for a new book on Paul due out soon, "The Amazing Colossal Apostle" by the same guy who gave us, "The Incredible Shrinking Son of Man"
This is good site with quite an informative post.Thanks and regards. It's my first-time visiting here. I came across so many helpful stuff within your blog particularly the on going conversation. From the tons of comments on your posts, I suppose I'm not the only one enjoying reading through your blog. Keep up the excellent work. Good and relevant post. I’m been looking for topics as interesting as this. I have heard about Robin Griffith-Jones is a Church of England priest, Master of the Temple in London.He is a Fellow of the Society of Antiquaries of London. Everyone are always asking unbiased about the benevolent archaic era. I retort, reason don't you talk the estimable today? I’ve got a many of loosen clock beside thesiss hand, plus can do all what I cherish! Just kind of articles definitely touches the heart would like to read more. This is a nice story and touches really my heart.The review in this post by John Bloom really appreciable. Awesome read. Thanks a lot for sharing this with us. This is such a good post to read. Stimulating me to read much more of your posts. Continue the good work. Hoping to see more excellent articles from you shortly. "The Vinci Code" is my favorite movie. I will be happiest person if I got any chance to meet the Descendant of Jesus. Thanks for providing all this information in this post. Will look forward to hear more from you. Enjoyed reading the post bookmarking the article for the further information. Wieso Tagesgeld so beliebt ist. Warum auch Tagesgeld Fragen und Antworten lässt. Wieso Tagesgeld so gut funktioniert. This is very interesting, thanks for sharring. I have saved this webpage and I truly intend on visiting the site in the upcoming days. Wie ein Gebäudeversicherung Vergleich funktioniert. I love the way you have written the whole article. Well with your permission allow me to grab your rss feed to keep up to date with forthcoming post. Thanks a million and please keep up the gratifying work. interesting book review, I think you are correct to say that it is pretty much impossible for one to analyze the entire spectrum of the life of Paul. I'll have to take a much deeper look at this book to really see how successful his attempt was. love the way you have written the whole article. Well with your permission allow me to grab your rss feed to keep up to date with forthcoming post. Thanks a million and please keep up the gratifying work. effort you put into your blog and detailed information you offer.Thanks. I really love the way you have share the article. The basic knowledge and the importance are welly graphed. Thanks for putting effort fort his article. Wieso Kreditkarten für Frauen so beliebt sind. Wie eine Kreditkarte kostenlos funktioniert. Wie man einen Onlinevergleich Unfallversicherung machen kann. Warum eine Gebäudeversicherung so gefragt ist.